White Paper – Mobile Restoration Workforce - Next Gear Solutions, Inc. 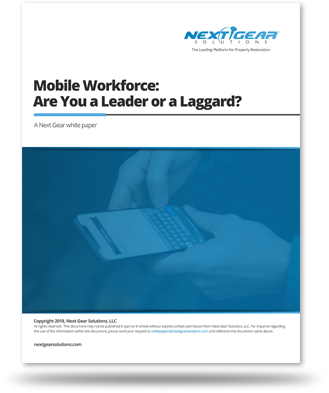 Mobile Workforce: Are You a Leader or a Laggard? Globally, mobile adoption has emerged as the primary economic growth engine for economies all over the world. Mobile technology can either be seen as a blessing or a curse, but its impact on our lives is irrefutable. Globally, mobile adoption has surpassed traditional PC usage and has emerged as the primary economic growth engine for economies all over the world. When we simply look at how technology has empowered consumers in the last decade, we find that mobile devices lie at the heart of this shift. Empowered by social networks and smart devices, consumers increasingly command how they engage with companies and brands. They have become judge and pilot, demanding a more personalized service and influencing the products and services they consume. Through this paper, we will look at the financial or operational gains those progressive small and medium businesses (SMBs} have experienced by harnessing and implementing a mobile strategy. Despite all the performance and cost improvements, there are many SMBs that still struggle to develop or implement a mobile strategy that will drive optimum efficiencies to help drive their business forward. For this paper, we've divided them in two camps: leaders and laggards. Complete the form to learn more.